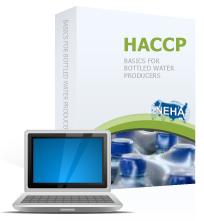 HACCP Basics for Bottled Water Processors is an online, self-paced course on the HACCP System and its prerequisites. The course focus is on the HACCP method to prevent unwanted hazards from being introduced into your bottled water operations. The course is recognized and accredited by the International HACCP Alliance. The course curriculum consists of 11 modules covering topics on meeting government, industry, and auditor requirements for the development of a working HACCP plan, including Good Manufacturing Practices as well as the Food Safety Modernization Act. Approximately 1 to 1.5 hours per module including testing.